The list of the species, studied by cryptozoology, might seem bizarre : some people compare it to the middle-ages bestiaries. This new branch of Zoology, posing its existence on elusive animals, needs a certain dose of creativity to shape the descriptions of the sightings. In any cases, even if large efforts are made to avoid fantasy, monsters remain monsters. "Are you still chatting with your friend from Vancouver ?
" Yes, I am... Why ?" " I’m gathering information about an animal... Please ask him if he has ever heard about caddy"
" He says that "caddy" is the guy in charge of carrying the clubs during golf matches..."
My first attempt to obtain any information about one of the most interesting protagonist of marine cryptozoology didn’t end properly in the best way ; but the mysterious presence, that for many centuries appears in the waters of Britannic Columbia, province of West Canada, placed to the South-East end of Vancouver island, seems to be something more that a joke or a hallucination. "Caddy" is the nickname given to the representatives of a population of presumed marine creatures, which are supposed to live in the waters surrounding the Vancouver Island, preferring Cadboro bay, from which their name derives. One of the first scientists interested in caddy is the American biologist Roy Mackal, who wrote in his book "Searching for hidden animals" not only the description and any presumed sighting of caddy, but also a precise zoological identity. Those scientists who have bounded their name to the one of caddy, are Paul LeBlond, oceanographer of the University of British Columbia, and E.L. Bousfield of Royal British Columbia Museum. According to Bousfield, only in the last century, the sightings of this creatures have been numbered at least 300 ; we are listing the most indicatives. In February 1934, Cyril Andrews and Norman Georgeson, two hunters who were on a little boat, shot a duck who fell into the water. Suddenly they perceived the shape of a big sea animal, over 12 m long, that suddenly emerged, seized the duck with its jaws and sank back into the water. The animal had a long, slim body, as the snakes ; the head resembled the one a horse, but earless. Strait of Georgia, Spring, 1939. Any employees of a local telephonic company sight two individuals of Cadborosaurus, probably an adult and a pup, they made bellowing sounds. Another sighting states that a caddy has been watched while it was capturing seals in the same zone, "tossing them about" and devouring them. A very important sighting, even if it’s less spectacular, happened in March, 1953, when the elusive caddy was spotted by Mrs E. Stout, an expert marine and fresh-water biologist, who could observe a creature with a big head and humps which emerged behind its neck, while she was walking along Dungeness beach. In January, 1984, the mechanic engineer Jim M. Thompson was fishing in the zone of Spanish Banks, near Vancouver, when a marine creature, moreover 6 m long, emerged at a distance of 30 m. It had a giraffe head, with two little bulbar appendixes, similar to horns, and flabby ears. In May, 1992 the music professor John Celona sighted a humped animal, moreover 10 m long while it was swimming. In May, 1994, the pupils Damian Grant and Ryan Green saw a 6 m-long animal, with two humps, while they were swimming in Telegraphic Bay. The most important sighting is the one of October, the 16th, 1937. The supposed carcass of a young individual of caddy was found inside the stomach of a sperm whale. An article about the topic, printed on the "Province" of Vancouver, described a rotten body, moreover 3.5 m long, with a horse-like or camel head and a flipper tail ; after all, its characteristics perfectly coincided with the descriptions of the supposed ocular witnesses. As a proof of the real discovery of the carcass, there are black & white pictures ( Picture 1 ), taken at Naden Harbour, that show, sufficiently clearly, an apparently unusual animal shape. The sightings, more generally the witnesses, that concern the Cadborosaurus, are ancient ( this animal is redundant in the oral traditions and in the folklore of the local indigenes ) and numerous. In their excellent book : "Cadborosaurus, survivor from the deep", Paul LeBLond and Edward Bousfield report almost 200 sightings, selected by a very wide range, based on scientific legitimacies. When the sightings of a cryptid are so copious, it’s difficult to obtain directly an univocal profile. Contaminations, connected to bad visibility, to emotions or fear, or to glimpses, cause the creation of a personal "monster", often described in very little detail, but alive only in the witness’s fantasy. But from this fanciful zoo, we can extrapolate an univocal profile, after having filtered the numerous descriptions through statistical considerations. In this cases, the useful statistical means is not the geometric average : if ten people maintain the observation of a snake-like animal, 10 m long and 3 say they sighted the same animal, but 30 m long, it’s probable that the cryptid’s dimensions are closer to 10 m than to 15 m, resulting from the geometric average of the lengths. The most useful statistic means in this cases is clearly the mode. On the grounds of the mode, extrapolated by the plausible sightings, a profile of the Cadborosaurus emerges, surprisingly similar to the animal photographed in 1937. From 5 to 15 m long. Snake-like body shape, with an extraordinary flexibility on the vertical plane. Head morphology variously described as similar to the one of a sheep, of a horse, of a giraffe or of a camel. Long neck, from 1 to 4 m.
Humps, or vertical loops of the body, in series. Anterior flippers. Posterior flippers absent or close to the body. Notched tail, horizontally flat ( as in whales ). I add : long hair on the back of the neck. The presence of this characteristic hasn’t been proved by the comparison with the standard, that’s to say : the individual photographed in 1937. However, because of the small dimensions of the individual, when compared to the ones of the above-described profile, we can assume that it was a sub-adult individual. From this point of view, if we want to assign the hair a connotation of sexual-dimorphism, we can think that the photographed carcass was lacking the hair, because it owned to a sexually-immature animal. The presence of a secondary dimorphic sexual characteristics in the cryptid’s morphology also explains why some sightings pointed out its presence and any others didn’t : the first ones would concerned to males ; the second ones females or young individuals. The hair as dimorphic sexual character is very diffused in Nature : I mention lions and sea-lions as the most emblematic examples. As I wrote in advance, LeBLond and Bousfield don’t mention the hair in the identikit of the cryptid. However, the classic iconography of caddy includes the characteristic, which is redundantly present in the illustrations of their book, hence the cover picture. Any sightings related to ears, up-ended or slack ones, and of cranial little horn-like appendixes. I don’t believe in the existence of the characteristic. The presence of wet long hairs on the nape of the neck might have given the impression that the animal had ears ( above all in the case of slack ones ), or little cranial bumps. The reiterated presence of elks, which swim across the straits where caddy is sighted, might explain the characters... At the same time, but in a non-satisfactory way, it might explain the vaguely equine profile of the cryptid’s snout. The eyes of the cryptid have characteristics which are frequent in many reliable witnesses. Often described as red, they present bovine languidness, they are quite rotund and unusually large, when compared to the skull : much more than what would be expected in an animal long more than ten meters. Generally big animals, such as the whales, have little eyes. Such a feature is common to those animals which live in dark environments ( for instance, tarsiers and many abyssal fishes ) and which have sight as their primary sensorial organ, unlike the whales. The habits of this animal are almost all unknown. However frequent, the sightings never have observations on the ethology of the species, because they have always been too short ( generally they last some minutes ). On the grounds of what we have, and above all on the grounds of what we don’t have, it’s possible to draw some conclusions on its habits and its attitudes. The Cadborosaurus is carnivorous : it has been seen feeding on ducks and seals. The Cadborosaurus has many characters typical of a good swimmer. LeBLond and Bousfeld support, on the grounds of the sightings, it could swim at 40 knots., Besides favouring the pure speed, its spindle-like morphology, in my opinion, gives a very good manoeuvrability. It swerves rapidly : laterally, to the top or bottom, to compete with the escaping prays. The long neck might be compared in its morpho-functional connotation, to the one of the plesiosaurs, to the one of many aquatic birds, or to the one of otaries, even if this is simpler. We obtain a profile of an active, voracious predator, capable to rival with very adapt prays, in the field of the swimming. The rationale on the grounds of this supposition is that, according to the authors, the animal would obtain an outline similar to the one of tuna’s, excellent swimmers. 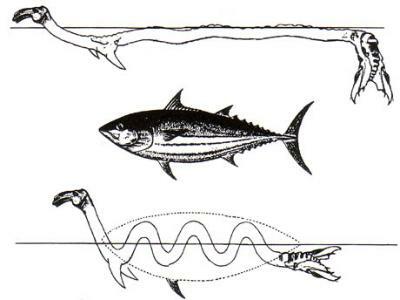 To affirm that a snake-like animal, "compressed" in this way, has the same hydrodynamic characteristics of a fish, only because it obtains a profile definable in an ichthyomorphic outline, is to affirm that a spring has the same aerodynamic behaviour of a cylinder. From a physical-engineeristic point of view it’s a nonsense. 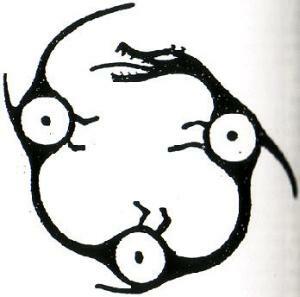 In Nature, no animal can writhe in this way : the loops are too many, too tight and vertical ( excluding snakes, capable to produce the above-described loops, but on a horizontal plane ). A Mammal with a long neck, elastic rachis and tail, can show only 2 loops, on the surface of the water : a dorsal one and a caudal one. Callosities or fat deposits, such as the ones of the camels, might justify other eventual humps. Probably, the swimming of the Caborosaurus is a mix between the one of Cetacea and Sirenia on one hand, and the one of Pinnipeds and Mustelids ( Lutrinae ) on the other hand : it is similar to the first ones because of the propulsive characteristics, expressed by a wide, powerful fish-like tail, horizontally depressed. It is similar to the second ones because of the acrobatic characteristics, expressed by a very flexible rachis ( that opposes the rigid axis of Cetacea ), and by a long and elastic neck. In order to define the habitat of the cryptid, LeBLond and Bousfield separated the sightings that occurred during the cold period and the ones that occurred during the warm period. Initially, they had arranged the sightings by seasons, but it hadn’t pointed out any relationship between the activity of the cryptid and the period of the year. However, the climatic variations are not always synchronized with the changing of the seasons : weather is unforeseeable, because of the effect of regional differences ( which are very strong at the latitude of Vancouver ) and global ones. They could assert that the Cadborosaurus frequents the coasts of Vancouver preferably during the cold periods. the cryptid habitually lives in colder waters : he reaches the sighting places when waters become too icy. We must understand, whichever theory is the correct one, where the caddy lives during the period in which it’s not observed. Probably the Cadborosaurus reaches areas relatively ( and reasonably ) near Vancouver and, obviously colder. 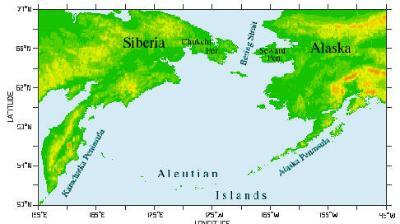 After having taken a look at a map, the choice is forced : North Pacific Ocean, between the Alaskan Gulf and the Bering Sea ( Picture 3 ). Even if the supposition is supported by evidence, it would remain just a supposition, without any validity if it wasn’t supported by anything else. The eventual presence of a cryptid similar to the Cadborosaurus, witnessed there, would argue the theory. In 1965, after the publication of the book "Le Grand Serpent-de-mer : le problème zoologique et sa solution", the zoologist Bernard Heuvelmans drew out the identikit of nine different aquatic creatures, still unknown by the official science. Among these, there was a sort of very specialized pinniped, which was defined by the author "sea horse", and to which the author gave the scientific name of Halshippus olaimagni. Heuvelmans listed more than 70 sightings of this creature, mainly in the cold waters of the North Atlantic Ocean and of the North Pacific. The author describes it as an animal with a dark, lucid skin and a moderately-long neck, with a sort of hair, with whiskers on the cheeks. The head is supposed to be similar to that of a horse, with very big eyes and big nostrils. The tail is supposed to be notched and horizontally flat, the body is supposed to be similar to that of the seals. It is supposed to move with vertical undulations, typical of Mammals. A second "marine monster" is pointed out in the same waters, on the grounds of sightings and of the oral tradition of the natives. It is supposed to be a very aggressive marine animal, whose head and neck are sometimes perceived. They emerge 2-3 m from the surface of water and their head and neck resemble a snake. According to the natives, it is supposed to attack the boats ; in the Bering Strait region, it’s represented with an alligator-like-head, long and thin body and six legs ; on the posterior part of the head it is supposed to have two little sharp horns. It’s named Pal Rai Yuk in the Nunivak Island ( Picture 4 ) and Tizheruk on Kin Island. Two cryptids, with characteristics similar to the ones of Cadborosaurus, are observed in the North Pacific Ocean, with, probably, a trespassing in the Atlantic one. On the grounds of what’s described above, I can affirm that the Cadborosaurus also lives in the North Pacific Ocean. The sightings of caddy in the waters of Cadboro Bay are frequent... But only considering that it’s a cryptid. Normally, if it had been a known species, the sightings would have been considered very sporadic. Furthermore, it’s evident that the anthropization in the Vancouver area, the first place of the sightings, is enormously higher, in comparison with the one of the Aleutian Isles and of Alaska, second place of the sightings. From this point of view, it’s probable that Cadborosaurus willsi is an alien specie of Cadboro Bay, which frequents it sporadically, maybe passing through for unknown reasons. On the contrary, it’s probable, that caddies spend the largest part of their own life ( for many individuals, all their life ) in the Bering Sea, or more generally in the whole North Pacific, perfectly undisturbed, because of the low, in any case absent, human presence ( this would also explain the scarcity of witnesses ). On the grounds of the witnesses, caddy is supposed to be an animal with solitary habits. But, having theorized that the cryptid’s population is placed anywhere else, we cannot be sure of what’s written above : it’s not rare in Nature that individuals of social species separate by the group and migrate anywhere else. Environmental causes, such as scarcity of food, unfavourable climatic periods et al., might also cause the abandon of their own group. I cannot establish with epistemological relevant exactness, on the grounds of the data obtainable by the witnesses, if the Cadborosaurus owns to a species with social habits, or not. After having drawn the description of the cryptid, now we must put it in a taxonomical context, arguing the attribution. In primis, the characteristics of caddy are so exclusive, that we can exclude ( sorry for the calambour ) the sightings concerned abnormal individuals, ascribed to known species. No ontogenetic cause might differentiate the Cadborosaurus by any other actual morphology of marine Mammal. About fossil Mammals and Reptiles, there is no problem : the attribution to the cryptid of the status of deform individual of an extinct species implicate the presupposition that the specie is not really extinct, with evident repercussions on the plausibility ( in terms of probability ) of the theory. It’s clear that the cryptid is of an unknown species. Waiting for the official recording ( of course : it will not be soon ), we are going to try in this work to clear about the argued attributions. The first one who theorized the existence of a huge snake-like pinniped with an equine snout was Heuvelmans : it’s the sea horse, Halshippus olaimagni, about which I already wrote in "habitat of the cryptid". Having lead the sightings of the sea horse and the ones of caddy to the same cryptid, legitimate the theory that caddy is a pinniped. I think that this ascription is very improbable. I don’t deny that many morpho-ethologic characteristics of the cryptid perfectly match with the ones of the sea-lions, for example. However, there’s a huge perplexity, which is epistatic on all the arguments in support of the attribution. Pinnipeds don’t have a long tail : the spindle-like body ends with a very short tail. Therefore, we should modify the morphology of the caddy, identifying the caudal flipper as formed by the posterior legs of the hypothetic macro-pinniped. Leblond and Bousfield, in their "Cadborosaurus, survivor from the deep", support this morphology, even if they don’t identify the cryptid with a pinniped. The obtaining of such a morphology would cause the redistribution of the inner organs on the whole length of the animal, with radical modifications of their shape and of the reciprocal dimensional relationships. This would cause big malfunctions : lungs, for example, would be too little or extremely long, club-like, in a cylindrical chest, not very extendable and with a minute diaphragm. Many muscles of the trunk would be extremely oblong, like the skeletal frame, whose vertical component ( the ribs ) would be missing for the biggest part of the animal’s length ( Mammals don’t have ventral ribs ), causing a structural weakness, a fragility that doesn’t match the performing swimming of the cryptid. The posterior truss would be very far from the encephalon. This would cause serious delays in the transmission of the voluntary nervous impulse, with huge motor dysfunctions, and of the coordination too. As for the previous point, such inevitabilities don’t match what we know of the caddy’s swimming. Even admitting I am wrong, that Natural Selection has forged such a pinniped, I ask myself : where are the fossil traces of the corresponding evolutionary way ? The occurring morphological modifications are many and deep : so I conclude that the generating phenomena would have been macro-evolutionary and not micro-evolutionary : the theory of the punctuated equilibria of Gould, which explains many "white pages" of the palaeontologic records, cannot be applicable, in this case. That’s to say, that the evolutionary phenomenon would have required a long time and, consequently, should have left some traces. Anyone could argue that snakes has a morphology very similar to the theorized one, and that that morphology is not only efficient, but also with a huge evolutionary success. But snakes are Reptiles, no Mammals. For instance, Reptiles are heterothermic animals, and have low oxygen needs. Many species have a primitive respiratory apparatus, that allows only a succession of respiratory events, divided by long lasting apnoeas. Everybody misses a real diaphragm, and help their respiration with movement of the viscera, above all the big liver. Rynchocephalia ( tuatara ) are obliged to swallow the air inside the lungs ( not setted ), because they pratically don’t succeed in ventilating. Lungs are on average less parenchymatous than the Mammalian ones. Referring to the snakes, they miss the sternum. The most evolved families ( Colubrids, Viperids, Elaphids, etc. ) have only the right lung. Than, with regard to the structural strength of the snake’s morphology : Ophids have ribs along their whole body. This grants them a solidity that Mammals, without ventral ribs, don’t possess. All things considered, I believe that the morphology which has to be assigned to the cryptid is the "long tail" one ; it must be categorically preferred to the "short-or-absent tail" one. The first morphology, redundant among the marine Mammals, has the advantage that it doesn’t alter the interior organs in shape or in reciprocal dimensional relationships. Moreover, it strengthens : the tail has a solid section. The ones of the chest and of the abdomen are hollow. The abdomen doesn’t have a skeletal frame either. On the grounds of what has been argued, I doubt that the Cadborosaurus is a pinniped. About 40 millions years ago, a gigantic Cetacean swam in the oceans. It was the Zeuglodon cetoides, also known as Basilosaurus ( Picture 5 ). The generic name points out that on its discovering as a fossil, due to the United-States Harlan and dated 1834, the long and snake-like skeleton was ascribed to a Reptile ( Basilosaurus means : the king of lizards ). Zeuglodon, an Archaeocetis, was characterized by anterior nostrils, opened at the top, mascellar bone not yet "pushed" against the frontal one and by conic teeth. The anterior limbs had already transformed into strong flippers, and the posterior ones were vestigial : the pelvic ring was strongly reduced, as for the actual Cetaceans. The body of these animals was very long and flexible, because of the high number of long vertebrae ; it ended in a bi-lobe tail, horizontally flat, similar to the ones of the whales, but not very wide and powerful. Due to this fact, Archaeoceti probably lived on the surface, and ventured to the deep waters only rarely. The first researcher who connected caddy ( and other "sea serpents" ) to the Zeuglodon ( or to a descendant of its ) was the biologist Roy Mackal. The identikit of Basilosaurus seems to match perfectly the one of caddy, with the exception of the long neck and the equine head, which are not typical of Cetaceans. They are imperfect whales, with a heterodontial set of teeth, as their ancestors Condilatra ( hoofed meat eater ) and cervical vertebrae not yet melted ( they could laterally turn the neck ). This huge meat eater, occupier of the ecologic niche which was of Pliosaurs, had neither the evolutionary exclusiveness of Mysticeta ( baleens and, in general, deep adaptation to planctophagy ), nor the one of the Odontoceta ( sonar ) yet. On this grounds, it would be acceptable ( and interesting ) the hypothesis that caddy is an aberrant descendent of the Zeuglodon, which had evolved as an answer to the selective pressure of the modern Cetaceans. Also in this case, there’s a matter of fact which refutes the attribution and cannot be set aside. Archaeoceta populated the seas for many millions of years : from Eocene to the superior Miocene. Than, they have been replaced by modern Cetaceans : many fossils of different species of Archaeoceta have been found during numerous expeditions of excavation, with a frequency which describes their success and decline very well. And yet, no bones ascrible to the suborder have ever been found in strata more recent than 20 millions of years ago. From this point of view, to admit that caddy is an aberrant Archaeocetes is to admit that the suborder survived in total "secrecy" ( in paleonthologic terms ) in the marine eco-systems, which followed one upon the other in the last 20 millions years. In my opinion, this is too improbable : the theory is not scientifically valid. Somebody could object that an individual of Latimeria, representative of a taxon which had been considered extinct from time immemorial, was captured alive in 1938. This Crossopterygian has abyssal habits, which have hidden it to Science ( but not to the inhabitants of Comore Islands ) for a long time. No fossils of the above-mentioned taxon, younger than 70 millions of years, have ever been discovered : in effect, Latimeria lived in total secrecy. However, science is science when it is ( also ) supported by statistic evidences... So, nobody must be astonished when an exception doesn’t write new scientific rules. On the contrary, it confirms them. On the ground of what I argued, I doubt that the Cadborosaurus might be an aberrant descendent of Archaeocetes. In 1995 LeBLond and Bousfield, after many years of field work, summarized the results of their researches in the above-mentioned book "Cadborosaurus willsi, survivor from the deep" and in a scientific article, published in "Amphipacifica Journal of Systematic Biology". In their studies, they identify caddy as a species of aquatic Reptile, still unknown to science. They support that, up to the general features of the head, of the two pairs of flippers and of the tail, caddy’s morphology is not too different from the one of Plesiosaurs : big aquatic Reptiles of the Mesozoic era. The characteristic posterior flipper of these animals could be approached to the tail during swimming, so that they formed a big terminal appendix, similar to an ornithomorphic tail. Well : many sightings of caddy would describe a sparrow tail. On the other hand, the theory of LeBLond and Bousfield has any other obscure points : serious incongruousness which don’t match the hypothesis of the marine reptile. The phenomenon of the parallel evolution generated aquatic Reptiles, Ichthyosauri, in many cases very similar to dolphins ( for instance : Stenopterygius quadriscissus ). But the tail of Ichthyosauri, as the one of fish and of any other Reptile, was vertically compressed. ...With one exception : Mammals. They express the preferential movement of flexion of the spine on the sagittal plane. Ichthyosauri had a vertically-flat tail because the propulsive beat was on the horizontal plan : they practically slithered in the water . Whales have a horizontally-flat tail because the propulsive beat is on the vertical plane : they practically gallop in water. Well : it’s known that the Cadborosaurus owns a horizontally flat tail, just as Mammals. Furthermore, coherently with this datum, the body loops of the cryptid, witnessed by many sightings, are vertical : that’s to say they are exactly orthogonal, in comparison with a hypothetical snake-like aquatic Reptile ( or with snakes themselves ). Trying to explain with the reptilian hypothesis the postural morphology of caddy, Dr LeBLond and Dr Bousfield theorized an aberrant evolution of a Jurassic suborder of crocodiles : Metrionichidae Mesosuchia ( Picture 6 ). Mesosuchia showed characters of primitivism in comparison with modern crocodiles, Eusuchia. At the same time ( and paradoxically ), 4 of the 16 families ascribed to the suborder ( including Metrionichidae ) also evolved a strong specialization to pelagic life. they had limbs transformed into flippers, with hyperphalangy, as Cetaceans. Their shape was very hydrodynamic, more than actual crocodiles. Many species ( included Metrionychus, cited by LeBLond and Bousfield ) had been lacking the dorsal plates, typical of many actual crocodiles, but un-useful in the sea. They had a caudal flipper very similar to the one of fish, which could produce violent lateral blows, to assure high speed in the water. The end part of the tail was sustained by a portion of the spine, which bent with a big angle downwards : this characteristic was typical of Ichthyosauri, such as Mixosaurus or Ichthyosaurus. On the grounds of the morphologic description of Metrionichidae, the theory which supports that they swim with vertical movements, as Mammals, must be rejected. The very strong analogies with Ichthyosauri, above all the vertical caudal flipper, don’t leave any doubts. It’s probable that these Reptiles were able to arch their back, but nothing more. In the end, Metrionichidae came to extinction 150 million years ago, during the superior Jurassic. Also in this case, the perplexities that I pointed out for the Zeuglodon are valid, with the aggravating circumstance that the palaeontologic "secretness" of Metrionichidae would have lasted quite 8 times more than that the one of the Archaeocetes. ... Mainly for heterothermic animals, as Reptiles. The only known aquatic Reptiles which can be found at those northern latitudes are marine turtles. But the conformation of Chelonia, compact and solid, is able to hold their body heat, obtained by the movement of muscles during the swimming or after exposure to the sun. The conformation of the Cadborosaurus differs from the turtles’ one, because it dissipates a lot of heat : the relationship between surface and volume is very high in a snake-like animal. Consequently, the inertial omeothermy is null. It’s not acceptable that such a Reptile could live at those latitudes. However, it cannot be excluded "a priori" the possibility that any sort of Reptile had adapted to such gelid waters because it had obtained the homeothermy. For instance : during Permian ( at the end of the Palaeozoic era ) in the southern area of Pangea a huge glaciation occurred. Any Reptiles adapted themselves to the new kind of climate, adopting a covering similar to the mammalian fur and, probably, becoming homeothermic. I must underline that these animals were strictly terrestrial and not marine. Liquids disperse heat much faster than gases, so they would have needed a more refined adaptation to the low temperatures than a precarious omeothermy, to survive in cold seas. The probability that a homeothermic Reptile, capable to live in waters at 5° C and with snake-like shape, ploughs the circum-artic sea is null. On the grounds of what argued, I exclude that Cadborosaurus could be a marine Reptile. According to what it’s been read ( and confuted ) in the previous chapter, caddy would be a recurring optical illusion, even though very realistic. On the grounds of the hundreds of verified sightings, We are sure it’s not so. So, what kind of animal are we talking about ? The classical ascriptions take into examination three big groups of marine animals : Pinnipeds, Cetaceans and, generalizing, pelagic fossil Reptiles. The range of possibilities quite completely covers the rose of those animals which evolved a very high adaptation to aquatic life. Just a few groups are outside of the range : first of all, Sirenia. [...] Sirenia is a group of Ungulates highly specialized for aquatic life. They have no relationship with Cetaceans, strictly similar to them for a classic evolutionary phenomenon. They have spindle-shaped body and anterior limbs changed into flippers ; the posterior limbs are absent. The tail is transformed into a flat horizontal flipper. The skin, very thick, is hairless in the adult. The head has dorsally-placed nostrils and the snout has big fleshy lips, with short sensorial hairs. The hearing is very developed, even if the auricles are absent. Sirenia are the only aquatic herbivorous Mammals. They live in not-deep waters, very rich in aquatic vegetation, such as estuaries of big tropical rivers, marine coasts, saltish lagoons. Any clues suggest that the Cadborosaurus is a Siren. At a first analysis, the morphology and the alimentary habits of Sirenia would prove the exact contrary. At first, they have very little eyes, very different to the ones described for the cryptid : large and round. Even the neck, short and stout, is antithetic to that of the caddy. The presence of strong lips makes the profile of the snout of Sirenids very different to that of caddy. 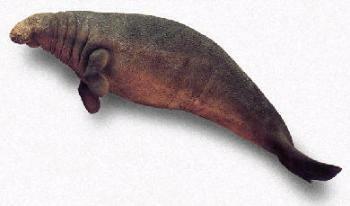 Finally, the diet : Sirenia are the only herbivorous aquatic Mammals. They are faithful to the origins as terrestrial ungulates, close to Proboscidae. They have an intestine specialized for eating of vegetables ( essentially aquatic plants and seaweeds ) : it may be 45 meters long, because the ingested material, more than 30 Kilos a day, is completely assimilated. After having compared under this point of view Sirens and Cadborosaurus, we realize that the two morphologies are reciprocally derivable. We read that two families of Siren exist : Trichechids and Dugongids. The first question is : if the Cadborosaurus is a siren, to which family is it closer ? On the grounds of the common morphology of the caudal flipper, we are inclined to believe it’s closer to Dugongids : as the cryptid, the dugong owns a bilobate and fringed flipper. On the contrary, the one of manatees is round. It’s quite sure that manatees derive by dugongs. So, the hypothesis that caddy is a manatee would mean that the caudal flipper, initially bilobate, became a round one ( from dugong to manatee ), and than it became bilobate again ( from manatee to caddy ). I think it’s improbable. Going on with the disquisition, any other evidence will support the above-mentioned affinity. After a careful analysis of the two morphologies, assuming thatthe caddy’s one is an evolution of the dugong’s one, the motive of the transformation clearly emerges :the abandoning of herbivory for the obtaining of a diet based on meat. An aquatic carnivorous animal needs, above all, good sight : that’s why the very little eye of Sirenia became large. Therefore, the increasing of the ocular globe has improved a visual apparatus, already absolutely efficient : the retina of dugongs can produce good sight even in case of scarce light. It would have been an evolutionary improvement and not a radical transformation. An active and aquatic predator must be able to swim very fast, to compete with preys. We have affirmed that caddy is very fast, being able to use an extremely hydrodynamic body and a powerful propulsive apparatus. It’s reasonable to admit that the body shape of caddy can derive from the one of the dugong : even if the neck is short and squat, the animal has a spindle-like body, very hydrodynamic, and a propulsive apparatus that let it swim up to 25 km/h. That’s partially due to its pelagic habits, that make it different from the much slower manatee. Caddy’s neck is very long. A carnivorous, supposed follower and sprinter, is advantaged if it possesses a long neck : Plesiosaurs, the Tanistropheus, many aquatic birds and sea lions use ( or used ) this feature as a very powerful fishing weapon. The cervical vertebrae of Sirenia differ from those of modern Cetaceans in that they are not fused together, and this gives these animals a certain mobility of the head. This would have allowed their extension and the extension of the neck muscles, with the following functional benefits we dealt many times in this work. Note : manatees are the only Mammals with 6 cervical vertebrae. Dugongs have 7, as do all others. This lead us to prefer Dugongs rather than Trichechids for the ascendance of caddy. Consistent with the morpho-functional rationale that describes the caddy, the skull is long. At first sight, it would again seem very different from the Dugongids’. I tried to represent graphically a "cadborosaurian" skull, on the grounds of what is known about the cryptid ( morphology and habits ). The images of Nade Harbour ( G.V. Boorman, 1937 ). I made the smallest possible changes to the cranial morphology of dugongs : only the strictly-necessary ones. I performed only the changes, explainable with the passage from herbivory to carnivory. The result is in Picture 8. The only main modifications that emerge from the comparison between the two images are related to the eye-socket ( larger ) and to the snout. The almost-90° rotation of the snub rostrum : after that, it had not been necessary to modify the dimensional relationship between splanchnocranium and neurocranium too much. It’s clear, examining the Naden Harbour carcass, that the snout is bent very low, a little further than the half of its length. That is coherent with the skull morphology of the dugong, which shows the same character, only emphasized. The re-sizing of the jaws. Dugongids has a very powerful chewing apparatus, like the elephants, which are relatives of them. On the other hand, a carnivorous animal does not need such strong jaws, unless it usually preys on very large animals. This is the case of the lions, which use their jaws for strongly block the neck of zebras and buffalos, with a thick skin and powerful muscles. In my opinion, this is not the case of the Cadborosaurus, which I suppose hunts small preys. On the other hand, being able the cryptid to become huge, even a 3-meters-long seal can be considered "sufficiently little". If we want to make a parallel between the cryptid and a terrestrial predator, it would be a cheetah. Under this point of view, I think that the jaws of caddy are not particularly strong. This fact justifies the sharpening of the mandibular jaw and the reduction of the associated muscles. On the grounds of what’s above, it emerges a head shape surprisingly similar to the one described by the sightings, even because the lip of the Siren, useful to eradicate vegetables from the bottom, would have lost its meaning, and it disappeared. The set of teeth of the Dugongidae mainly consists of big molars, which are substituted when used up by teeth below, like the elephants. They have low and flat crown : it’s a consequence of the strong adaptation to herbivory, like also many other characteristics of the splanchnocranium. Note : any fossil forms are toothless. I wonder on which grounds I can support the predatory habits of caddy, after having been placed in front of this evidence. The difficulty, in other words, is the capability of catching the eventual prey, of an animal which misses anterior teeth. It’s known that the males of the dugongs, older than 12 years, possess a couple of long upper incisors ( Picture 9 ). This characteristic is sometimes in the females too, and it has probably the same function of the walrus’ tusks ( which, however, are not incisors, but canine teeth ). We are supposed to believe they are the answer to the above-mentioned question. Also admitting that caddy is the descendant of the actual dugong, I don’t think that the two superior incisors alone can guarantee a strong bite, sufficient for performing the hunting purposes of the cryptid : even after the hypothetical adaptation of this characteristic, a winning bite is not possible. One more time, a characteristic of Dugongidae helps us. This animals posses corneous plaques on the mandibular jaw and on the palate. Such structures have a double function : a chewing one, being accessories of the molars, and a eradicatory one, being accessories of the lip. I’m allowed to suppose that the rearrangement of the splanchnocranium has also affected the corneous plaques, maybe changed into sharp and serrated borders. The advantage, in the context of the adaptation to predation, would be huge : not a single set of teeth, but many sets of corneous blades, having the same characteristics of the teeth, placed on the palate and on the jaws. In Nature, analogue examples exist. The most emblematic one concerns another group of marine mammals : the Cetaceans Mysticetes. They missed the teeth and evolved the baleens : corneous laminar structures, placed in sets, and hanging from the palate. Every baleen has the shape of a right-angled triangle, whose long side, facing towards the oral cavity, is fringed in large filaments. The whole fringes of the baleens create a filtering system, essential for the particular diet of the Mysticetes, which feed on minute organisms, suspended in the water. In order to be able to define the evolutionary development that differentiated the cadborosaurs by the Dugongidae as plausible, I have to discover if animals, so radically adapted to a diet of grass and vegetables, might have aberrated into a carnivorous kind, or an omnivore one, however strongly predisposed to predation. From a strictly-physiological point of view, a specialized herbivore can metabolise the meat : it’s known that cows are ( or have been ) fed integrating hay and fodders with carneous flours, produced with remainings of other animals. It’s still alive the memory of BSE, the bovine spongiform encephalopathy, a prionic infection, transmitted to the herds all over the World just by carneous flours, produced with infected animals. After this incident, many countries banned, at least officially, this kind of fodders by the cow houses. In the meantime, the illness had been transmitted to our species, infecting and killing some human beings. So : the intestine of herbivores is capable of degrading and assimilating very poor and indigestible aliments, such as the cellulose. On the other hand, the existence of structures refined for this purpose, such as the complex stomach of Ruminants, doesn’t prevent more digestible foods from being assimilated. The contrary is not true : the carnivores, with the exclusion of rare exceptions, ( for instance, Ursidae Ailurinae ), don’t succeed in feeding on grass. It’s due to their short intestines. That’s true. But do ( or did ) carnivore animals exist, which evolved from strongly herbivore kinds ? Propleopus oscillans ( Picture 10 ) was a kangaroo, lived between Pliocene and Pleistocene. It belonged to the family of Potoroidae, whose actual kinds are known as rat-kangaroos. They are Marsupials very similar to the Macropodidae, which includes wallabies and real kangaroos, but showing more primitive features. Potoroids had a digestive apparatus that, depending on the species, can be simple or very highly evolved. However, these animals base their diet on grass, mushrooms, seeds and soft vegetables, integrating it with some invertebrate. Propleus oscillans was a giant kind of rat-kangaroo, being 2-meters long and weighing 70 kilos ( the last pleistocenic kinds were the largest ). It was characterized by long and bladed teeth. For sure, it opportunistically obtained the largest part of the meat it ate. On the other hand, it’s probable that he actively hunted, especially birds, little Reptiles and Mammals. But, is what’s argued above applicable to the case at issue ? That’s to say : can Sirenia eat meat ? The answer is yes : it’ proved that the manatees, but above all the dugongs, integrate their diet with animal proteins. Now and then, they obtain them by dead fish ; more frequently, they feed on molluscs and other invertebrates, after having brought them to light turning the sand with the snout. As the Propleopus, the Cadborosaurus, would have evolved from a prevalently-herbivorous ancestor, following an aberrant line, which would have amplified a bland instinct of integrating the diet with animal proteins. On the grounds of what has been argued before, it’s probable that the Cadborosaurus is classifiable to, or it simply derives from, Sirenians Dugongidae. I’m sure that this theory has any weak points. Yet, after having got over the initial obstacles, the theory shows less incongruence than the official ascriptions. Each characteristic acquired by caddy should derive by the modification of any characters of the Dugongid ancestor. That is consistent to what is defined by the evolutionary laws of life : nothing is invented, everything is recycled ( the feather by the scale, the limbs by the flippers... ). Caddy is an animal of cold waters. The actual dugongs aren’t : they prefer coastal, warm environments. That’s to say : is the Cadborosaurus an animal which originate at latitudes with a tropical climate and which later adapted to cold waters ? Or : is the Cadborosaurus an animal which originate at latitudes with a cold climate, by a Dugongid already adapted to cold waters ? Aleutine Islands, 1742. The zoologist Georg Wilhelm Steller, embarked as doctor during the second expedition of Vitus Bering at Cape North, sighted a group of huge herbivore animals. He had discovered the Steller’s sea cows. After 26 years, the delirium of human omnipotence extinguished the already-exiguous population, that’s to say, the species. 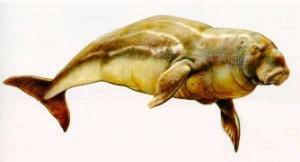 On the grounds of those first descriptions, Hydrodamalis gigas ( Picture 11 ) was a huge Dugongid, up to 10 meters long, and weighed more than 4 tons, with a wrinkled skin ; the head was littler and the body more spindle-shaped than the actual dugongs. When the sea cow was found, it already was on the way of extinction : the Aleutine population was made by the last specimens of a species, which dominated the cold waters of the North Pacific for the entire lasting of Pleistocene ( about 2 millions of years ) : from Japan to California. It was the most evolved species of the subfamily "Hydrodamalinae" ( the only group of Sirenians which adapted to cold waters ), appeared with Dusisiren jordani, lived during Miocene, approximately 10 millions of years ago, by aliteriinae dugongs. At the end of that eve, a gradual lowering of the global temperature happened, which led , not only in the Sirenians, to the appearing of giant species : the body-mass increasing is useful in those cases, because it reduces the body-heat dissipation, on the grounds of a lesser surface/volume relationship. At the same time, the skeleton of the proto-Steller’s sea cows became thinner : the bones of the modern Sirenians are solid, large and heavy, as the ones of the archaic kinds. The skeleton of the Steller’s sea cows was not : they fed on kelp, on the surface of water. They needn’t to plunge and root the depth anymore, so hydrodamalinae progressively lost the ballast and got lighter than water. The diet based on kelp led to a further transformation : the frontal rostrum of the splanchnocranium became much less angled than the one of Dugongids. The process which led by the Aliteriinae Dugongid ( paradoxally more similar to the living Dugonginae, in habitat and in morphology ) to the Steller’s sea cow was very long : it lasted more than 8 millions of years and it is very well documented by the fossil record. The existence of such animal predisposes to believe that caddy evolved by the Steller’s sea cow. the actual dugongs are animals littler than the cryptid : they are in a range of 2 to 3 meters long, with a weigh which is around 200 Kg. Dugongs is adapted to warm climate. Dugongs have a very heavy skeleton, which is not good for a speed predator. The evolution prefers the easy ways, often being opportunist. From this point of view, the Steller’s sea cow is the best start point to reach the cryptid, because the passing by its morphology to the one of the cryptid involves a number of steps lower than the other possible attributions. It’s surprising how many obliged steps from the standard dugong to caddy ( increasing of the dimensions, adaptation to cold waters, skeletal relieving, straightening of the frontal rostrum ) started during the changing by Dusisiren to modern hydrodamaline. Now, we have to understand where and how Cadborosaurus evolved by Steller’s sea cows. The total absence of a palaeontologic record which proves the evolution by a hydrodamalinae does not let us individuate the appearing of the Cadborosaurus. For sure, this species originated in North Pacific, in an unknown point of the distribution area of the ancestor Siren. On the grounds of the few evidences, we cannot go further. The absence of paleonthologic proofs of the caddy’s evolution can not be explained, whichever origin it has. Repeating what has been written in " A Pinniped ", such loss can not be justified by the theory of the punctuated equilibria : I think that the modification occurred by whichever attributable model, official or not official, are too deep not to have involved macroevolutionary laws. I don’t go further in the problem. I only argue that another cause of the loss of fossil remains of the cryptid is the relative youth of the species. On these ground the attribution "Hydrodamalis gigas" lays on very well. It is a "young" species itself, even if already extinguished. To admit that the Cadborosaurus descended by it is to admit that the Cadborosaurus is a fruit of a very speed evolutionary process, not longer than 2 millions of years. It’s very difficult to calculate the timing of evolution : the history of life have had huge accelerations, alternated by very long standstills. Under this point of view, I am not able to say exactly which time is definable as physiologic for the passing by the Steller’s sea cow to Cadborosaurus. In a totally span-metric way, intending to argue at the best of my capabilities the total absence of fossil traces of caddy and of its origins, I think it’s acceptable to suppose that Will’s Cadborosaurus evolved during the second half of the Pleistocene period. The intuition that a Siren might become carnivorous is of Roy Mackal. 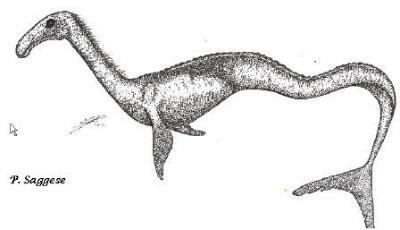 The intuition that Cadborosaurus is a Siren is of Bernard Heuvelmans, who theorized that a relic population of Steller’s sea cows was the probable cause of the sightings of caddy, or at least of a part. On the grounds of what has been affirmed in the work, even if I am a little bit far from the intuition of the father of cryptozoology, I think that Cadboroasurus willsi can be ascribed to Sirenians. That obliges us to correct its name. "Cadborosaurus" was created to describe what was thought to be a big sea serpent. But we saw that the possibility that the cryptid is a Reptile is very little. Whichever group caddy belongs to, even if it is not a Siren, it must be ascribed to the Class of Mammals. It’s clear that the suffix of the name is inappropriate : "saurus" is translated ( from the Greek language ) in "lizard", and it is a word generically used in nomenclature to define Reptiles. There are many important precedents. 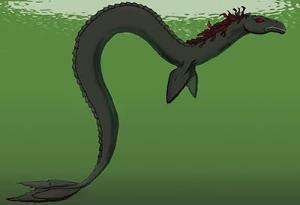 One of them has been discussed in this work : the Zeuglodon. The first fossil remains had been ascribed to a snake-like Reptile, named Basilosaurus. After a deeper analysis, the real nature of the animal arose : it was a Cetacean. And its name was changed. By the light of the above-mentioned perplexities, I propose to change the scientific name of the cryptid from Cadborosaurus willsi to the more appropriate Cadborotherium willsi. The last mysterious siren has been found.